#1 The biggest news this week is the Animal Crossing mobile game, Pocket Camp. You can see the whole direct here to see what's going to be in the app. It comes out late November. I'm honestly not a huge fan of gaming apps because I don't love being attached to my phone for too long. However, I love the concept of the game (you can decorate your own RV!) and I've played every Animal Crossing game so I have to play this one as well! Pocket Camp is only available to download in Australia at the moment but there are ways which you can change your app store to play the game early. I'm just going to patiently wait until November. #2 I decided to purchase one of the Pusheen blind boxes because they kept popping out everywhere and I really wanted one. I got the candy corn Pusheen! It was one that I wanted so I was thrilled. They're smaller then I thought they would be but still just as cute! I'm thinking about getting another one! #3 If you haven't listened to Epik High's newest album I highly advise you to do so, it's spectacular! Whether you like k-pop or not (even though I wouldn't call Epik High K-pop they're more of Rap/R&B/Hip-hop group) there is a lot of English in the songs and even a few songs that are completely English. #4 I recently found Tiffany's blog. I found her through this post, which is such a cute idea for snail mail. If you love pastel stationery and planner related stuff then I think you will love her blog! #6 Only two more Blogtober posts. I had such a fun time making these posts for you guys, especially the crochet patterns. Which reminds me, only one more month until Blogmas! I'm still not sure what I'm going to do for Blogmas I was thinking of following the same posting style as Blogtober's because December can be really stressful and posting everyday can be bothersome. I also might not post the 12 Days of DIY this year either but don't worry I will still be posting a few DIY projects and crochet patterns. Who is excited for Blogmas? #7 Stranger Things 2 came out today! I'm so excited but I have to wait until my younger sister gets back from work because we watch the show together. Who else is going to binge-watch this weekend? 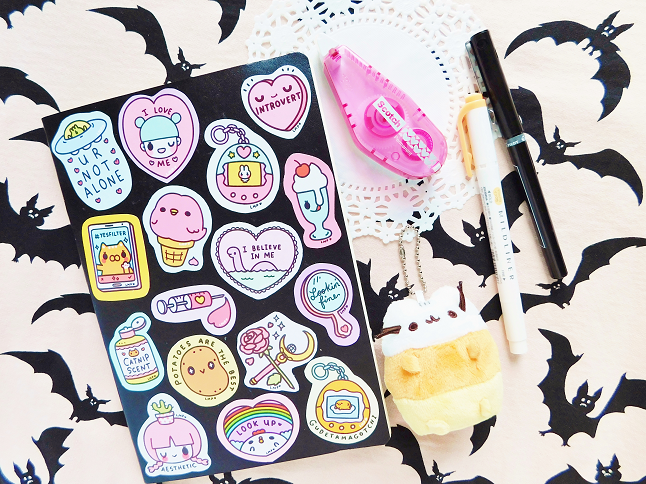 Such cute stickers, can't wait to see the upcoming planner posts!